Ram Kuvar Bai is a daily wage laborer who took the first step to bring water to a dry village in Madhya Pradesh. Salidhana has extremely less rainfall and getting enough water for daily needs was a struggle. It was declared a dry village by government engineers after failed attempts of digging for water. The village only had one hand pump which was on a hilly slope. There was no proper path to the pump and so the women often injured themselves while fetching water. The village women got together and built steps which made it easier for them to go up and down the slope. By building these steps the women understood that if they worked together, they could solve their community issues. Encouraged by this success, the villagers now wanted to dig a well to solve their water crisis. Ram Kuvar Bai offered her land free of cost and enrolled as the first person to work on the well. A local knowledgeable village elder was called to identify the spot for digging. He used Padiyar, the traditional method of rolling a coconut to identify a spot for digging. On the first day only seven people turned up but as days progressed more and more people started to come to work on the well. Their hard work bore success and after days of digging, they struck water. This was a moment of great celebration. Salidhana's well set an example and inspired other neighboring villages to dig their own communal wells. A few months after the well was dug, the villagers of Salidhana worked with the local authorities and got their kaccha (temporary) well made pukka (permanent) under the National Rural Employment Guarantee Act (NREGA). You can help this program by donating to cost of the processing centres and transportation of kits to the villages where there is need. You can give with confidence because every program on our platform is GIVEASSURED. Give now and help in solving neglected issues in the rural communities. Cloth for Work' is an award-winning initiative. It creates a barter between donated clothes from cities and labor and resources of rural communities. In the last year, Goonj has initiated over 3500 'Cloth for Work' activities in over 1700 villages without any monetary transactions. The villagers work on infrastructure building, water, agriculture, and sanitation-related works as part of this program. All the material collected from urban India comes to Goonj Processing centers across major cities of India for processing. The material is carefully sorted according to different criteria like age, gender, size, usability etc. Care is taken to make sure that all material is in usable condition. They are assembled into family kits. These contain essentials for a family's needs like clothes, shoes, utensils, blankets, woolens etc. The kits are sent to different parts of the country for distribution among the communities. This is enabled by Goonj teams and partner organizations. The program covers the cost of the processing centers and transportation of kits to the villages where there is a need. Give now to help communities work together to bring sustainable solutions for their problems. Goonj opens up a dialogue on problem afflicting the villagers, encourages local community participation and ownership in resolving issues their own issues. Instead of moving ahead with a set agenda and framework for implementation, efforts are customized according to the needs of the local communities and their priorities hence fostering bottom up approach for inclusive development in the region.. .
Communities are rewarded with Goonj’s comprehensive “Family kits” comprising basic essentials like clothes, shoes, utensils, blankets, woolens, utility items for their efforts. As such, Goonj’s circular repositioning of urban wastes as powerful resource is not just an economic model, an approach but a transformative movement ensuring societal changes at the grassroot level with higher cross-sectiol civic engagement and a more equitable disposition of resources between urban and rural strata. With total of 4280 effective “Cloth For Work” activities this year, Goonj aspires to grow more as an idea, a movement and an instrument of change. It is no secret that India’s water crisis has escalated to alarming levels… With traditiol sources of water like wells, ponds and rivers fast dwindling, the rural communities are worst affected. Here is a story from (Alkal village, Raichur, Kartaka). 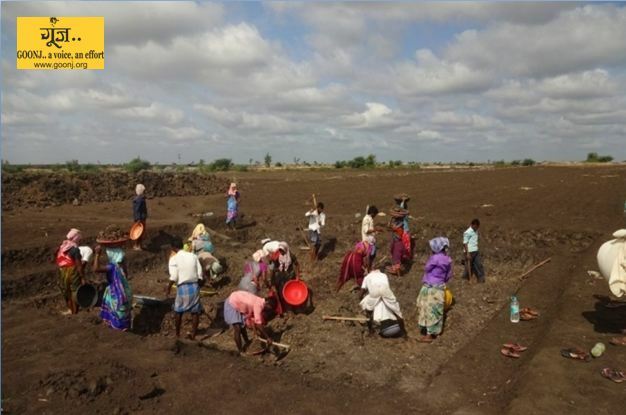 Regular water crisis drove 160+ parched villagers to dig a farm pond in their area to accumulate rain water for farming. Encouraged by Goonj, people dug 60ft*40ft pond with a depth of 5ft in just two days!! Improved groundwater level means better agricultural productivity. The locals were rewarded with Goonj’s comprehensive “Family Kits” for their hard work. Here is another story from the villages of Palghar dist. in Maharashtra. When a community in a village meeting decided to take up the task of cleaning their wells and the area surrounding it, over 100 villagers participated in a span of 13 days to clean 6 wells just before monsoon. One such case was of the well in urgent need of repairs with holes leading to slush all around creating a breeding ground for mosquitoes. When Goonj team encouraged the people to take action, they not only rebuilt the well boundary and platform but also made separate washing area in just 2 days. Women of Devgharpada had a long sigh of relief once the cleaning and repair work was undertaken. As a part of collective hard work of 17 villagers for 5 days, there was tremendous change in hygiene maintence of the local water resources. “This well is a source of water for 250+ people. The filth around it made it difficult to reach it. Now women of our families don’t have to worry while carrying water.” exclaimed Nilesh, from the village.